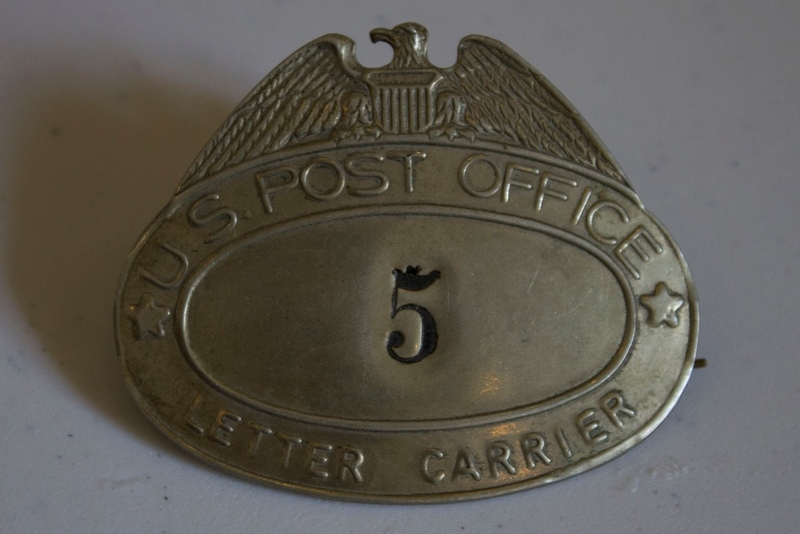 In 1922, the letter carrier’s badge was redesigned. The new badge was solid, of nickel-plated metal, elliptical in shape, and topped with a 1/2 inch tall eagle with wings spread two inches wide. The numbers, raised in the center of the badge, were 9/16ths of an inch long. The words "U. S. Post Office" were raised along the top, and the name of the Post Office and state were along the bottom. Raised five-pointed stars adorned the right and left sides, visually separating the text. The badge was curved at 10% to conform to the shape of the headgear. "Letter Carriers’ Uniform: Badges." United States Postal Service. 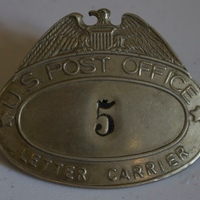 https://about.usps.com/who-we-are/postal-history/letter-carrier-badges.pdf. "Letter Carriers’ Uniform: Overview ." United States Postal Service. https://about.usps.com/who-we-are/postal-history/letter-carrier-uniform-overview.pdf. “U.S. Post Office Mailman Badge, 1922.” RICHES of Central Florida accessed April 23, 2019, https://richesmi.cah.ucf.edu/omeka/items/show/5594.